The Republican nominating contest is shaping up like a great poker game. The former governor of Massachusetts is facing off with the current governor of Texas. The odds-makers are number-crunching the hands. The voters are laying down bets. And the future of America is the stake. Now, the word among the prestigious movers and shakers – both Republican and Democrat -- is that Mitt Romney is holding the all-powerful electability card firmly in his delicate, city-slicker hand. Romney is seen as more temperate in his speaking mode, more sophisticated perhaps, certainly more urbane. Romney has spent nearly all of his adult life in high-rolling circles, board rooms and the like. He could be the poster boy for country club Republicans and apparently, a great many insiders would love to call him their candidate. Well, okay then. But that still leaves the fundamental question of whether America can be brought back from the precipice of history’s dustbin by Massachusetts-style, bureaucratic, Big Brother government or if it’s going to saddle up and have the courage to swallow a massive shot of Texan low-tax, low-spend, slim-down at the federal level to get us through to a brighter American morning. I couldn’t possibly be here today without complimenting your great governor. He’s doing one heck of a job. The nation can learn a lot from a governor who says if you want to attract good jobs you gotta keep taxes down, you gotta keep bureaucracy down, you gotta get education to work for the kids – not just for the teachers union – and he is pursuing an agenda which is pro-growth, it’s pro-creating jobs in this state. The rest of the country could learn a lot of lessons from Governor Rick Perry. He’s a great governor. I wish President Obama would have paid more attention to Governor Perry because the president has done exactly the opposite. Well, it’s sad to say but I think many Massachusetts citizens probably wish now that Governor Romney himself had paid more attention to Governor Perry because much of what Romney did while governor of the Bay State uncannily resembles Obama-style, tax-and-spend, Big Brother government. Governor Romney didn’t need to do any actual governing in the form of getting big concessions from his liberal legislature to get his own big-bleeping-deal “universal” healthcare passed. All he had to do was fold ‘em. Liberals got everything they wanted and Massachusetts citizens were left holding the empty bag to the tune of increased costs, a bare increase in actual coverage mostly at state expense and the predictable doctor shortage with longer and longer wait times for patients. 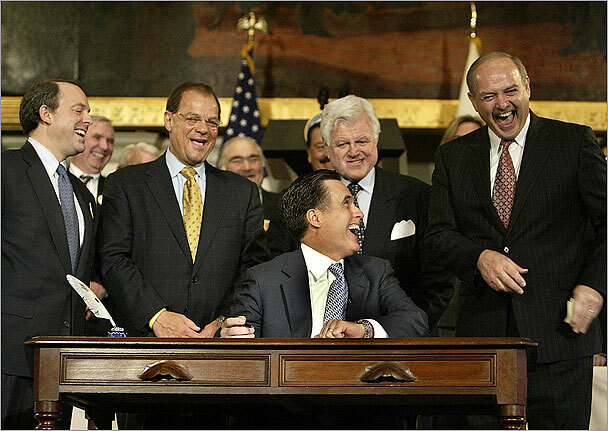 Then Romney genially folded to the “universal care” Democrat winners and jovially signed the technocrat’s dream bill. Ted Kennedy can be seen just behind the suckered governor smiling like a Cheshire cat. Actual governing, as Romney should have learned, isn’t quite as easy as corporate-boardroom technocratic number crunching. Downsizing a government is nothing like selling off parts of a company to make it more profitable. And there is no evidence that Mitt Romney effectively downsized the bloated Massachusetts government. His healthcare act only up-sized the Bay State’s bureaucracy. Downsizing a company merely requires the decision of the purchaser. Jobs get eliminated, people get laid off. At the flick of a technocrat’s finger, downsizing happens. Profitability returns. Downsizing a government, on the other hand, requires the support of the majority of the populace. And selling the downsize becomes far more important than all the facts and figures which support its wisdom. Mitt Romney wasn’t even able to whittle down the Bay State’s bureaucracy as governor. How in the world does he think he’s going to take on the federal downsizing which has become essential for American survival? Defending his own technocratic, committee-solution, bureaucracy-loving governing style in one of the bluest states in the country has got to be a lot tougher for Mitt now that he would be faced with Obama’s technocratic, committee-solution, bureaucracy-loving governing style of the last 3 years. Being a graduate of Harvard must have worked great for Mitt when he ran for governor of Massachusetts in Harvard’s front yard, but now that Barack Obama has ruined the Harvard brand nationwide for at least 50 years Mitt has to hide his Harvard stuff rather than flaunt it for votes. Sad, really. Barack Obama fooled a whole lot of moderate/independent voters in 2008 and his actual record was so slim and filled with so many “present” votes that he could pull off the most disingenuous campaign in history. Obama has become the poster child for political opportunism. Mitt Romney’s record of political flip-flopping to make himself more palatable to non-Massachusetts voters reeks of similar opportunism. Mitt was all for abortion before he entered national politics; now he says he’s against it. Mitt was in favor of “don’t ask; don’t tell,” but then he was against it. Mitt was for gun control laws; now he says he supports the 2nd amendment. Mitt was all for illegal immigration amnesty; now he’s against it. None of Romney’s political stands seem to have been made upon sound principle, which leaves voters with the queasy notion that Mitt changes views with the winds of focus groups and can’t be trusted to tell voters the truth up front. How on earth will Mitt Romney fare in such a contest? He was born with a silver spoon the size of a thriving auto company, spent his adolescence in a posh private school, spent two years in Paris on the tab of the Mormons, then romped off to Brigham Young and soon landed in the rose garden of Harvard. Since then, Romney has spent nearly all of his adult life flitting from one corporate board room to the next, buying up companies, laying off workers in one downsizing maneuver after another, growing very, very rich on what Obama will say was the suffering of far more downtrodden and worthy souls. And if faced off with Barack Obama, the son of a goat herder and a teenage mom, Mitt Romney will become the white, posh, country-club punching bag for all the new Obama-impoverished voters and their limousine-liberal enablers. On the other hand, Rick Perry came from genuine hardscrabble roots. Perry wasn’t a bookworm; he became an Eagle Scout instead of the teacher’s pet. But Perry’s no slouch in the brains department. One does not get certified to fly big jets for the U.S. Air Force without some heavy-duty brain power. All in all, Perry seems to have opted for learning the things that apply to real life, while perhaps shunning those things preferred by the eggheads in academia. It seems more than a little naïve for Governor Romney to see himself as the more easily electable candidate in a face-off with Barack Obama. Evidently, Mitt has hung around most of his life amongst the shallow-civility crowd and does not even see the class-warfare and anti-Mormon dirt that Obama will soon be hurling his way – if he is the nominee. With each new peek at Romney’s electability card, it looks more and more like a joker to Perry’s legitimately earned hand of four aces. I can’t help thinking that if it weren’t for Romney’s millions bankrolling his own campaign his poor odds of electability would have shown themselves as the joker they are – long before now. The stakes could not be higher in this election. And the last thing I want is to be taking Romney’s joker-filled hand to the table against the vilest cards-up-the-sleeve politician ever to stride up to the table. I’m betting on the hand with four aces.